After fifty years of occupation, Israel has reached a critical point in time. It is more important than ever to ensure that the two-state solution remains possible both on the ground and in public opinion. While a majority of Israelis support a two-state solution, they do not believe it is possible right now. To bring about a fundamental change, we need to restore hope. On May 27th, Peace Now will bring back hope. On a recent visit to the doctor's office, the nurse asked me if I have recently felt depressed or hopeless. I paused and pondered the impact that developments in both Jerusalem and Washington have had on me. The nurse noticed my hesitation and said, "Oh, it's routine, sir. We are required to ask every patient about their emotional state." I had to think. How do you honestly reply without being sent to the psychiatric ward… Well, I said, "Hopeless? No, definitely not hopeless." It's not hopeless. Not at all. Had I thought it was hopeless, I would have found something else to do. Particularly today, perhaps more than any other day on the calendar, it’s important to keep this sense of proportions. Our father, Arthur Stern (z”l), was a Holocaust survivor, so like many Jews, today’s Yom Ha’Shoah – Holocaust Remembrance Day – touches us personally. Dad was born and raised in Hungary as a highly-educated and traditional religious Jew, whose father was a prominent leader of the Budapest Jewish Community. While he studied law at the University of Budapest in 1944, the Germans occupied Hungary, and our father and his family were deported to the Bergen-Belsen concentration camp. Near the end of the war, he and surviving family members were sent to a refugee camp in Switzerland where he began to put his life back together. He continued his education, and best of all, met our mom Edith (he was her bridge instructor! ), who had arrived in Switzerland as a refugee from Germany after Kristallnacht. Since we were young, our parents shared many stories about their upbringing in Germany and Hungary, the war, and its implications to their families. Like many survivors, dad was able to miraculously “move on”, and spectacularly so. He became an accomplished electrical engineer and inventor, and was the first Jewish president of the International Association of Electrical Engineers, the world’s largest technical professional organization dedicated to advancing technology. Dad applied lessons from the Holocaust to a commitment to human rights, equality and justice in the US and in Israel. While he saw Israel's survival and security as supremely important for the Jewish people, he believed that Israel's conduct was just as crucial. As a Holocaust survivor, he saw both of these as fundamental. He started the California-Israel Chamber of Commerce to help strengthen Israel’s economy, and his most central commitment to Israel became his leadership role with Americans for Peace Now, where he served as a Board and Executive Committee member and as co-chair, and then chair of its regional activities in Southern California. His experience had led him to hold the Jewish people and Israel to the highest of standards with regard to their use of power and treatment of others, believing we should rise above the tendencies and inclinations towards suppression when confronted by obstacles. Dad found particularly abhorrent those in the Israeli settler movement and their supporters who elevated land over human rights and peace, and particularly those who did so using Jewish religious justifications. He would not sit idly by while such arguments were made and such actions taken. We are loathe to imagine his disappointment in the recent “Regularization Law” that transfers ownership of private Palestinian land in the West Bank to the Israeli Jewish settlers who took the land and established outposts contrary even to Israel’s own law. On this Yom Ha’Shoah, it is profoundly troubling to think about dad in the context of the “Entry Law,” recently passed by the Knesset. This law, which prevents entry to foreign nationals who support peaceful protest by way of a boycott, including a targeted boycott of Israeli settlement products, is beyond the pale for a democracy. It ostensibly bars people from visiting Israel because they have different political views from those currently in power. In this most absurd reality, our Holocaust survivor dad, who cared so much about Israel, would actually be prevented from visiting Israel. Americans for Peace Now has just decided to cancel its Israel Study Tour in June because of the "Entry Law." This trip has particular significance to our family. Dad participated multiple times, a couple with our mom and with one of us. Our parents gave the experience to a granddaughter as a college graduation gift, and soon after dad died, we all made plans to join the next APN Israel Study Tour. The joy that dad experienced and enrichment he received from being in Israel, meeting with leading Israelis and Palestinians from the political and activist worlds, the media, and other areas, was a highlight in his life. Today, as we remember the Holocaust and our dad who was so fortunate to survive it, we also remember the lessons he learned and passed on to us, and we redouble our commitment to working for a better Israel, which proudly manifests the best of Jewish values, and for a better world. Why did the Jews wander in the desert for 40 years before reaching their homeland? The Talmud teaches, “There is a long way which is short and a short way which is long.” What does that mean? Sometimes one sees what seems to be a better way — “the short way” — but it turns out to that, in reality, the way which seems easier is wrong. The shortcut taken ends up forcing one to go back and do what seemed at the outset to be harder, but was, in truth, the only legitimate way. It was from that seemingly tortuous, lengthy, journey that the Israelites learned to leave behind their slave mentality and do what was right, rather than what was easy or tempting. The Israelites’ journey turned out to be one in which there were important lessons to be learned. If 40 years in the desert was to teach us a lesson, what are the lessons we’re to learn from 50 years of occupation (10 years longer than the Jews wandered in the desert!)? The lesson certainly can’t be that occupation brings security for Israel. Israel’s security establishment overwhelmingly believes that without bold political leadership, the occupation will lead to Israel’s destruction. Those tasked with Israel’s security — Mossad, Shin Bet, and officers in the IDF — overwhelmingly believe that occupation does not bring security, but does just the opposite. It's been a good couple weeks for supporters of West Bank settlements. On March 22, it was reported that new construction in settlements had risen by 40% in 2016. The next day, the U.S. Senate confirmed David Friedman – a staunch supporter of settlements – as U.S. ambassador to Israel. On Thursday, Israeli Prime Minister Benjamin Netanyahu announced that a new settlement would be established – in the heart of the West Bank – for evacuees from the illegal settlement outpost of Amona. In effect, Netanyahu rewarded them for breaking Israeli law, which outlaws these outposts, by breaking international law under which all settlements are illegal. 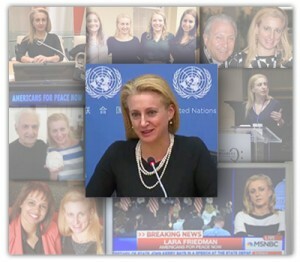 After seventeen years at Americans for Peace Now, our longtime director of policy and government relations, Lara Friedman, is moving on to become the president of the Foundation for Middle East Peace (FMEP), an important member in the community of Washington-based groups striving for peace and security for Israelis and Palestinians. Over the past two decades, Lara – perhaps more than anyone else – has defined APN, its footprint in DC and beyond, its mission and its role. Today, she is one of the leading US experts on all things relating to the Israeli-Palestinian conflict and is recognized as such worldwide. Thankfully, we are not losing Lara. As she likes to point out, she is moving only several city blocks away. She will still post her invaluable weekly Legislative Roundups on our web site and keep sending them to her long list of subscribers. We are confident that Lara will further tighten the already robust cooperation between APN and FMEP. 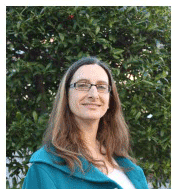 This week, Lara sent out a heartfelt message to our Board of Directors, saying: "(…) it has been an honor, a privilege, and a joy to be part of APN these many years. I am immeasurably proud of this organization and its work. 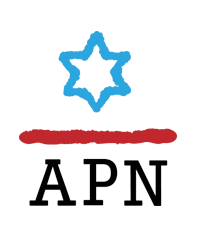 And while leave-taking is bittersweet, I take comfort in knowing that APN will continue to be the most principled, powerful American Jewish voice working for peace and security for a democratic, progressive Israel." We are very proud of Lara. We’re deeply grateful for all she has done for APN and for our cause. In recognition of Lara’s immense accomplishments, with APN and for APN, please make a tax-deductible donation for Americans for Peace Now. I’ve been devoting much of my life to activism in support of Israel’s future wellbeing, advocating for peace and security, working to bolster Israel as a democracy and a Jewish state, living side by side in peace with a sovereign Palestinian state. I was raised with the infant state of Israel in the late 1940s as the sixth child in the household of my parents Philip and Ethel Klutznick, activists and strong supporters of Israel’s right to exist and thrive as the homeland of the Jewish people. Dad, an international Jewish leader, advocated for the survival and the growth of Israel throughout his lifetime, but warned in the early 1980s that Israel must negotiate peace with its enemies, a common sense position of strength through peace. Monday, Israel’s Knesset kicked me in the behind. It made me into a persona-non-grata. "A person is obligated to get drunk on Purim until he cannot tell the difference between ‘blessed is Mordecai’ and ‘cursed is Haman’.” Purim is upon us. The wicked Haman convinces the clownish King Ahasuerus to kill all the Jews by executive order, but Queen Esther prevails upon the King to rescind this dictate and Haman is hanged. Day after day, our current reality reads like a story concocted for Purim. We see a carnival of populist buffoonery in which reality is indistinguishable from satire. Professional comedians, who straddle the line between reality and fiction, feel like the politicians are trespassing, usurping their turf. Tu Bishvat, a holiday in which Israelis cherish the fruit of the land and plant trees, begins this Friday evening. But in the West Bank, extremist settlers have made it a national sport to destroy olive trees belonging to Palestinian farmers. And when the settlers need a new bypass road, it is the government of Israel which uproots Palestinian-owned olive trees by the hundreds, as is happening these days near the West Bank town of Qalqilya – just to make more room for settlements and allow the settlers easy access to Israel. In his meeting with Israel’s Prime Minister Benjamin Netanyahu, President Donald Trump will have a valuable opportunity to assert long-held US policy on the settlements in particular and on America’s policy toward resolving the Israeli-Palestinian conflict. That includes recent approvals for constructing more than 5,500 homes in West Bank settlements, Knesset bills to annex large parts of the West Bank to Israel, and bills to retroactively legalize settlement construction that violates Israeli law.